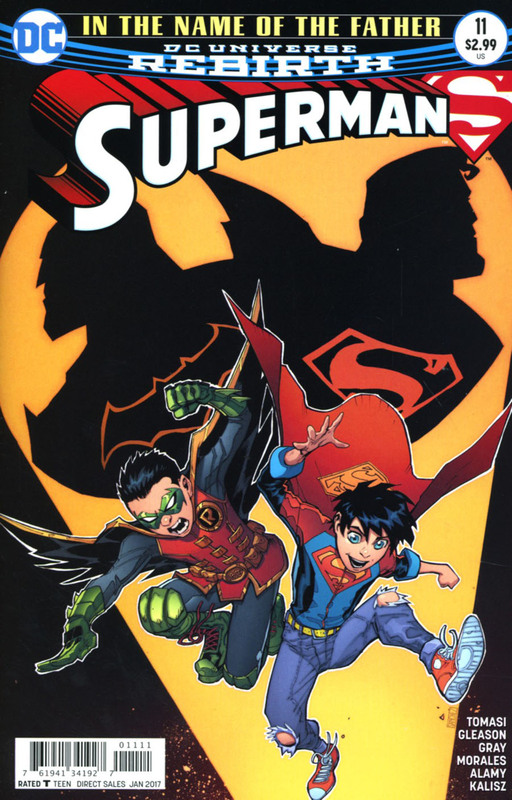 "In the Name of the Father" - Part 2: "World's Smallest"
Damian and Jon wake to find their costumes stripped of their identities and have been left in a bunker miles from home. Bruce is monitoring the boys from the Batcave while Clark is monitoring from a safe distance out of sight ready to intervene should they fail the challenge to work together. They find Nobody is part of their first task, if they pass her they earn their logos. During the fight Jon unleashes heat vision while in pain and it causes a small avalanche which Nobody has to rescue them from. Damian steals his 'R' symbol, a rail map and airline tickets and leaves Jon to fend for himself. Jon tells Maya that he understands the bootcamp is to teach them and so Nobody gives Jon his zipper tag so he can brandish his shield and race after the train. Meanwhile, Damian, confident he will pass the task alone, unfurls the map on the train rooftop and notices too late that Goliath is the next task. Jon arrives and leaps onto Goliath's ears and the two buck back and forth while Damian it thrown down into a carriage filled with seafood. Damian promptly uses the fish to make the giant bat think with his stomach instead of his fists. The task is taking too long and they realize they have just seconds to act before the train hits the end of the track. Using the fish Jon convinces Goliath to help them fly to safety. Bruce is impressed at Jon's resourcefulness but Clark is not convinced they can work together. Using Goliath as a shortcut the boys come up against an unexpected storm (courtesy of Superman) but their methods differ which leads to the storm overcoming them and sending the duo into a garbage tanker. Superman sends Goliath home and tells the boys they must meet him in the Batcave to earn their capes. 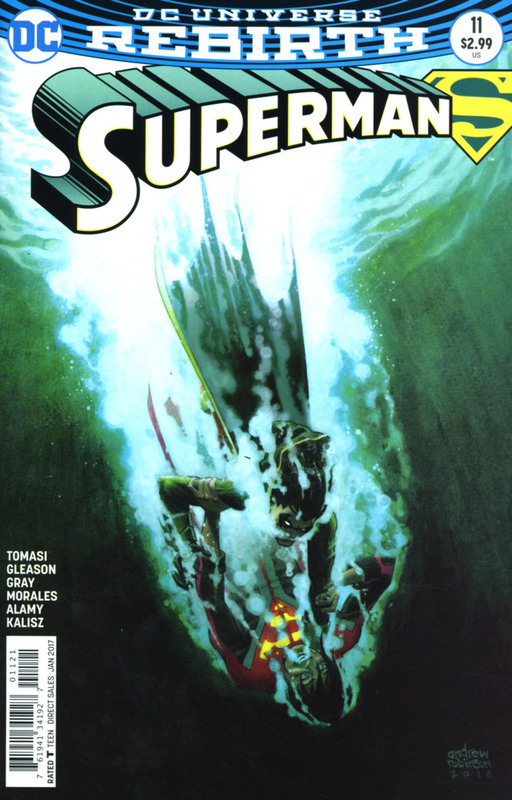 When Jon and Damian arrive they find some genetic material of Batman's greatest foes have merged into what they dub 'Mister Squish', a huge protoplasmic creature that makes short work of capturing Alfred, Clark and Bruce. Seeing their fathers in dangers spurs the boys into action. Damian analyses the weak points and strategizes an attack with Jon and his powers. As the boys succeed they discover they failed all the trials they were set but despite Batman's protests Alfred steps in. He tells them that they worked as a team when it counted most and for that they are now the Super Sons! They might not get on all the time but they do when it counts! Story - 5: Well they went and did it... they made me like Damian Wayne, more specifically the relationship between Damian and Jon. Nobody and Goliath have their roles expanded somewhat and this time around work well in the absence of Batman and Superman who are studying their sons' skills. For fans of cartoons in the 1980s take a look at 'The Anointment Trials' episodes of Thundercats because this really gave off that vibe. This is a neat set up to an ongoing series. The interspersed humor helps balance out the action sequences and make for a really fun story arc. Art - 5: I find that Patrick Gleason is at his absolute best when the action amps up to ten and this issue is just such an occasion. This issue needed large splash panels and bright coloring to give it that boost to highlight the action scenes. Pages 17, 18 & 19 are particular standouts. Great fun! Cover Art - 4: A little bit of an animated series feel to the cover and it perfectly sells the story you're about to get inside. It feels very old school and really projects a fun atmosphere. It is always good to see heroes enjoying being heroes. Variant Cover Art - 4: A fantastic cover, but though it looks visually amazing, I'm glad it isn't illustrative of their relationship. Jon and Damian are less adversaries now and more into bickering, which is comical and adds to the fun dynamic between the pair. The coloring palette owes a lot to making the cover 'pop'.